Hall of Famers: Umpires: Bill Klem, Billy Evans Red Sox: Harry Hooper, Herb Pennock (dnp), Babe Ruth, Tris Speaker. 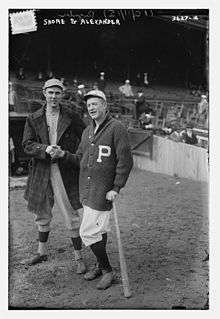 Phillies: Grover Cleveland Alexander, Dave Bancroft, Eppa Rixey. In the 1915 World Series, the Boston Red Sox beat the Philadelphia Phillies four games to one. In their only World Series before 1950, the Phillies won Game 1 before being swept the rest of the way. It was 65 years before the Phillies won their next Series game. The Red Sox pitching was so strong in the 1915 series that the young Babe Ruth was not used on the mound and only made a single pinch-hitting appearance. Arrangements for the Series were made on October 2, 1915, in a meeting of the team owners, league presidents and the so-called National Commission at the Waldorf-Astoria Hotel in midtown Manhattan, New York City. Red Sox owner Joseph Lannin lost the coin toss for home field advantage, and Phillies owner William F. Baker chose to have the first two games of the Series in Philadelphia. The league presidents selected the umpires, and it was announced that J. G. Taylor Spink would be one of the official scorers. One controversy surrounded the allocation of tickets to the Red Sox' Royal Rooters fan club. Each visiting team was allocated 200 tickets, but the Red Sox requested an additional 400 on behalf of their supporters. The Phillies' Baker Bowl sat only 20,000, and their above-cited owner, William Baker, refused to allocate additional tickets for visiting fans. The matter was resolved by National Commission chairman Garry Herrmann, who gave the Red Sox tickets from the Commission's own Series allocation. The Phillies won Game 1, 3–1, although New York Times reporter Hugh Fullerton wrote of the future 300+ game-winning Hall of Famer, "[Grover Cleveland] Alexander pitched a bad game of ball. He had little or nothing" in his review of the game, headed "Nothing but luck saved the Phillies." The Times also reported that a crowd of 10,000 gathered in Manhattan's Times Square to view a real-time mechanical recreation of the game on a giant scoreboard sponsored by the newspaper. The Phillies were not to win another postseason game until 1977, nor another World Series game until 1980. The Red Sox swept Games 2–5, all by one run, and by identical scores of 2–1 in Games 2–4. 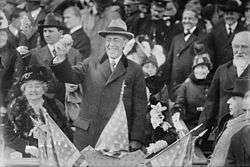 In Game 2, Woodrow Wilson became the first U.S. President to attend a World Series game. This was the second straight year that a Boston team beat a Philadelphia team in the World Series after the Braves had swept the Athletics the year before. In the top of the third inning of Game 3 at Boston, with two out, one run in and two runners in scoring position, Phillies' slugger "Cactus" Gavvy Cravath hit a line drive to deep left field which was caught for a harmless inning-ending out in the spacious Braves Field outfield. In Fenway or Philadelphia's Baker Bowl, it might have been a home run or at least an extra-base hit which might have turned the Series around. The Phillies had packed some extra outfield seats into their already-small bandbox of a ballfield, shortening the distance from home to the outfield wall even more. This proved crucial in the decisive Game 5, in which Boston's Harry Hooper twice homered over the moved-in center field fence and Duffy Lewis followed suit. In Braves Field, those would have been extra-base hits at best. Both of Hooper's hits, including the eventual game-winner in the top of the ninth, actually bounced over the fence and were home runs by the rules of that era although they would have been only ground-rule doubles by present-day rules. The Red Sox won on three home runs by two of their outfielders, two cheapies by Harry Hooper (see above) and one by Duffy Lewis. Those were the only round-trippers in the entire Series, the first four games being pitchers' duels. ↑ "World's Series Starts on Friday" (PDF). New York Times. October 3, 1915. Retrieved June 3, 2009. ↑ Fullerton, Hugh S. (October 9, 1915). "Nothing but luck saved the Phillies" (PDF). New York Times. Retrieved July 10, 2009. ↑ "1915 World Series Game 1 – Boston Red Sox vs. Philadelphia Phillies". Retrosheet. Retrieved September 13, 2009. ↑ "1915 World Series Game 2 – Boston Red Sox vs. Philadelphia Phillies". Retrosheet. Retrieved September 13, 2009. ↑ "1915 World Series Game 3 – Philadelphia Phillies vs. Boston Red Sox". Retrosheet. Retrieved September 13, 2009. 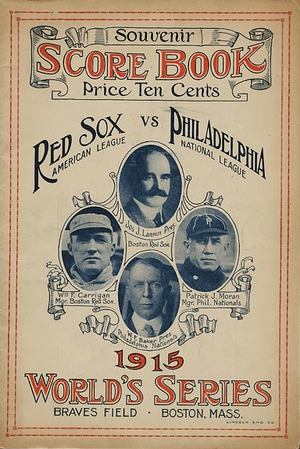 ↑ "1915 World Series Game 4 – Philadelphia Phillies vs. Boston Red Sox". Retrosheet. Retrieved September 13, 2009. ↑ "1915 World Series Game 5 – Boston Red Sox vs. Philadelphia Phillies". Retrosheet. Retrieved September 13, 2009. Cohen, Richard M.; Neft, David S. (1990). The World Series: Complete Play-By-Play of Every Game, 1903–1989. New York: St. Martin's Press. pp. 57–60. ISBN 0-312-03960-3. Reichler, Joseph (1982). The Baseball Encyclopedia (5th ed.). Macmillan Publishing. p. 2123. ISBN 0-02-579010-2. History of the World Series - 1915 at The SportingNews. Archived from the original on 2008.